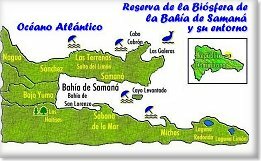 The Samaná Peninsula is located at the extreme northeast of the Dominican Republic. Unique, different and beautiful, it is geologically the oldest part of Hispaneola and was, until quite recently, an island in its own right. Cristopher Colombus named it the "Gulf of the Arrows", because his ships were received by the early original Amerindian inhabitants with a "rain of arrows" which forced them to sail away with care. 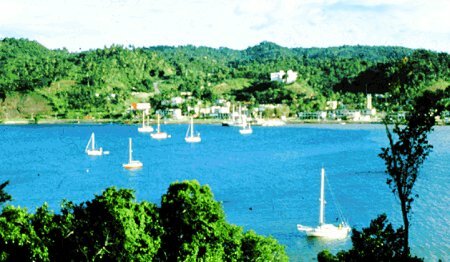 Samaná has always attracted visitors, although not so much for the undisturbed stretches of white, palm-fringed, sandy beaches as for its important strategic geographical location. French incursions alternated with the intrusion of English and Dutch buccaneers and pirates. 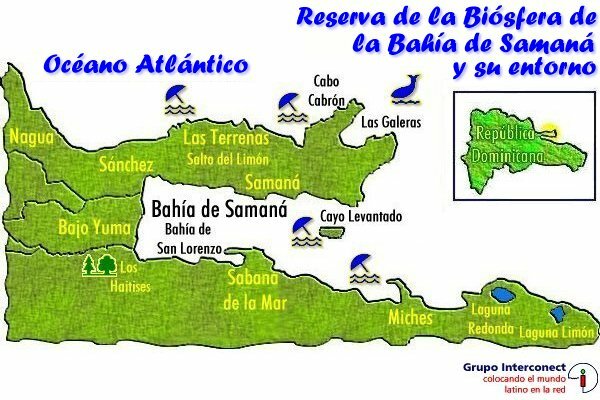 In the nineteenth century Samaná was captured by Napoleonic forces, and was even sold to the United States for one million pesos. 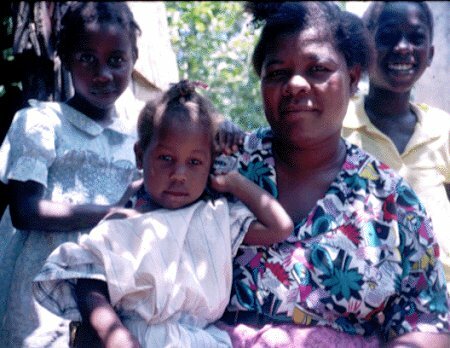 The natural safety of the bay made Samaná a focus for ship-based commerce, with navigable river and rail links to the interior, and a region of immigration, attracting Haitians, Puerto Ricans, Jamaicans and other islanders from the English-speaking Caribbean, not to mention the "English" from Philadelphia. 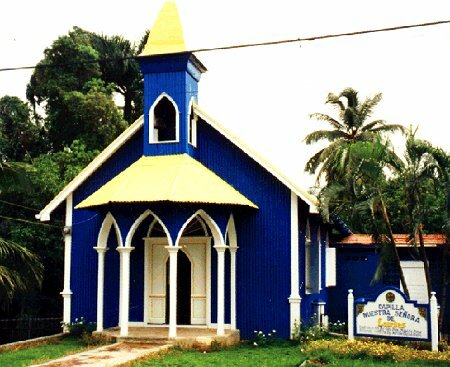 The resultant cultural diversity and mix in Samaná is intriguing. From African Methodist, Wesleyan to Catholic churches, from petroglyphs and pictographs to Barchata and Bamboulá, from Pica Pollo to "Donplin". 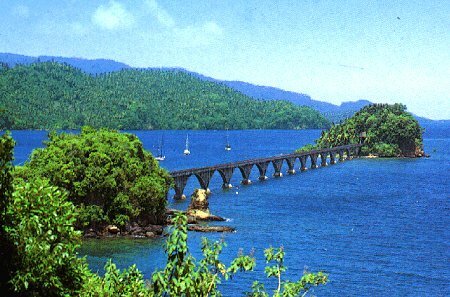 The peninsula and its surroundings has a rich and fascinating heritage. The towns and villages, caves, wrecks, and the landscape modified by human activities are alive with traces, vestiges, remains and reminders; although sometimes a little interpretation is needed. Samaná has long attracted certain regular visitors. For eons humpback whales from the North Atlantic have migrated every winter to the warm and protected waters of the Bay of Samaná. Under the strictest guidelines, developed by the Association of Boat Owners in Samaná and CEBSE (Center for the Conservation and Ecodevelopment of Samaná Bay and its Environment), these playful colossi can be admired at fairly close range without intimidating mothers and their calves or risking your safety. In view of the outstanding natural beauty of the region and its unique natural and cultural resources, the initiative has been taken to have the contiguous area of the peninsula, the bay and Los Haitises recognised as a Biosphere Reserve. This program operates at different levels: naturalist guide training, community education, working together with and advising the local and national tourism industry, government organizations and development agencies. The mid-term aim is to develop tourism which brings economic benefits to the local communities and the region, and conserves the outstanding natural beauty and resources for posterity and the long-term viability of the tourism sector. Biosphere Reserves are protected areas in terrestrial, coastal, and marine environments that have been selected to serve as representative examples of a countries natural and cultural patrimony. Reserve designation is provided by the United Nations Educational, Scientific and Cultural Organization's (UNESCO) Man and the Biosphere Program (MAB), initiated in1971. The Biosphere Reserve is the oldest and only internationally recognized program which designates protected areas with the objective of making conservation compatible with economic and social development. 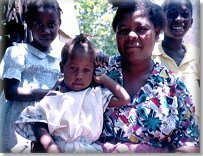 CEBSE, a Dominican non-governmental, non-profit organization founded in 1992, is actively engaged in the conservation and sustainable development of the region and has established an ecotourism program. This program operates at different levels: naturalist guide training, community education, working together with and advising the local and national tourism industry, government organizations and development agencies. The mid-term aim is to develop tourism which brings economic benefits to the local communities and the region, and conserves the outstanding natural beauty and resources for posterity and the long-term viability of the tourism sector.